Have you ever dreamt of bringing the weird and wonderful creatures of your imagination to life? Or having the most amazing monster line-up on your shelf? 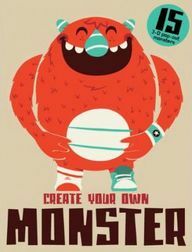 For monster enthusiasts of all ages, this box-set includes 15 different templates, 12 of which have been gruesomely illustrated by trend-setting artists, plus three blank DIY sheets for you to customize with your own designs. Create your own set of cute and scary monsters to play with and line up in a colourful display, or to send to friends using the specially designed envelopes included in the box. (Carries EU Toy Safety Directive CE logo).